The definition of a small hydro project varies but a generating capacity of up to 10 MW is generally accepted as the upper limit of what can be termed small hydro. We can say it is the development of hydroelectric power on a scale serving a small community or industrial plant. In North America, the generating capacity of small hydro can be stretched up to 30 MW or 50 MW. 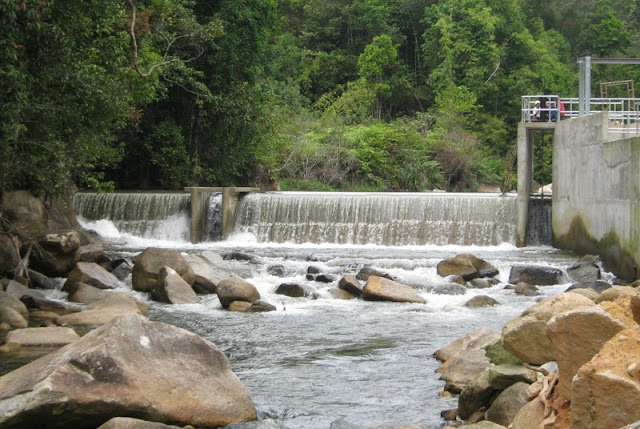 Check here for an example of Proposed small hydro-power plants in Tuaran, Sabah. Small hydro can be further subdivided into mini hydro, usually defined as less than 1,000 kW, and micro hydro which is less than 100 kW. Micro hydro is the one that I am so interested as I have always wanted to power up a small community of about 25 houses in my area. These will qualify for Renewable Energy FIT for 'Small Hydro' for a period of 21 years from FIT commencement date. Partnership: A smart move by Perak government. While it is commendable that Malaysia rolled out its RE initiatives with by forming SEDA to administer and manage the implementation of the feed-in tariff mechanism, it does little good if there is no technology transfer. What Perak did was to get SEDA to actvely involved in its plan to train and maintain one of the RE sources, i.e. small hydro-power. One may say hydro-power has been here for ages, but Perak went the extra mile to go down to the grassroots - preparing the small players in hydro electric power generation. Bernama reported a couple of days ago that SEDA Malaysia has entered into a partnership with the Perak State Development Corporation, via Perak Hi Tech Park (PHTP) Sdn Bhd, to provide training on how to maintain small hydro-power plants. The introduction of this course will benefit many prospective hydro-power plants developers. Under the partnership, PHTP will source technology experts from Brodarski Institute in Croatia to conduct the inaugural training, the first technical cooperation between Malaysia and Croatia. "One of the gaps identified by SEDA is the need to address the lack of competent human capital in terms of technical knowledge in designing, constructing and maintaining small hydro-power systems in the country. Hence, the collaboration with PHTP is most timely to address this gap". if such hydro near you house, it was better for own use, right? because the seda pay you 24sen/unit which is lower than prevail market price.